JR is our poster child for the tolerance of this breed to the ineptness of humans' bumblings. At age 3 1/2 JR developed a sand colic that proceeded to a life threatening laminitis. For the next 4 years of his life he was the guinea pig for many different trials of trims and shoes, stall rest and limited turn out. 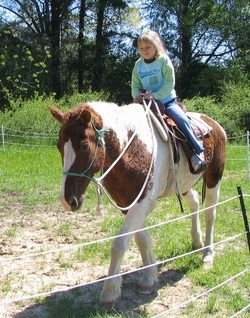 Very little of his life was a normal horse life but JR didn't let it get him down. Despite the suggestions to curtail his life JR and I found some wonderful barefoot trimmers and he has been barefoot ever since. My beautiful granddaughter had her first solo ride on JR when they were both 8. He was meant to be here for her. Chico had a rough start at life but proved he had the will to be a never quit pony. His mom came to us bred and was not yet two when Chico entered this world. Mom was very protective of this little bundle and kept him from us for a while. She taught him not to trust humans so to this day Chico is not the first to greet you at the gate. He did have a wonderful foundation of training with PNH methods. Chico is a very smooth ride. Travvy is an extreme trait gelding that is as funny as they come. I love this horse and have quite a time getting much done with him because he is such a dufus. He can get tangled in anything and then puts his nose in your chest to cuddle. A horse like this requires a great sense of humor. Sparky, sweet, loving and just a little bit devilish. Our last born foal was a bittersweet success. It called an end to our breeding program and all the excitement and anticipation of waiting for the new babies. 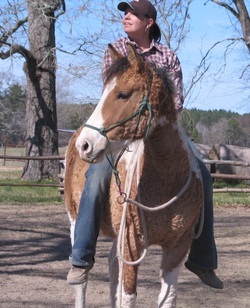 He is a beautifully conformed and gorgeously curled gelding that will most likely be with us for life. 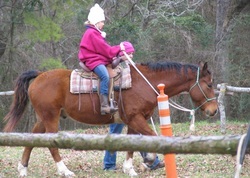 He, like all of our horses has been started with PNH methods and proved to be unflappable his first ride out on the trail. Now to put more miles on him to become the ambassador of the breed his daddy would have wanted him to be.